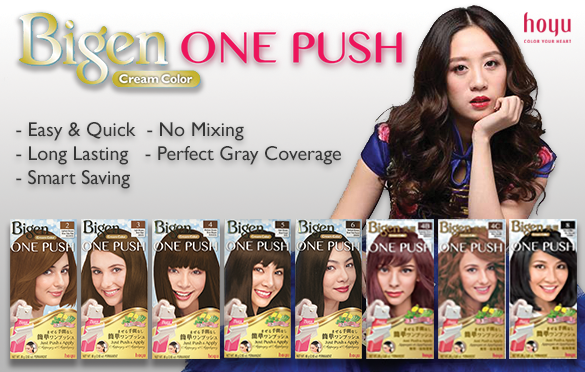 Bigen™ One Push cream color in available in five Beautiful shades of Brown. The new innovative design protects the hair cream from exposure to air, and remains fresh. With one single push, the innovative dispenser dispenses the developer and colorant cream allowing you to directly apply the mixture to your hair. No need to premix or messy bowls. Just a finger - one push and apply. No need to premix. From hairline to ends. Even for roots. Bit-by-bit use. Save the remainder for next use. 1 instruction leaflet in English, French, Chinese, Japanese and Korean. Warning! This product contains ingredients which may cause skin irritation or allergic reaction on certain individuals. The following skin allergy test must be conducted 48 hours before each time you color your hair. Wash a small area on the inside of the elbow with mild soap and water. Set the nozzle onto the Bottle and push down until the side-locks are firmly engaged. - Be careful not to press the button when attaching the nozzle part. - The colorant and developer will not dispensed evenly if the nozzle is not attached correctly. Press the button on the top of the Bottle, and dispense a small amount of cream in a bowl. - Press the button down strongly until it stops. Mix the cream and apply a bit of the mixture to the test area (about 1 cm2) with a cotton swab. Allow the test area to dry and leave undisturbed for 48 hours. - After use, wash the nozzle as described in the back of the instruction leaflet. If there is reddening, burning, itching or any other irritation in or around the test area, you are allergic to the product and must not use it. If there is no reaction in 48 hours, you can proceed with hair coloring. Warning! Keep the bottle away from face, sink and walls etc. when you first dispense for the cream may splatter. Always conduct a Skin Allergy Test 48 hours before each time you color your hair. Make sure that your hair is dry and clean. If your hair is dirty, contains excessive hair styling products, hair oil, temporary hair colors and metallic powders, wash your hair with shampoo the day before using this product. Cover your clothing with a cape or towel. Apply waterproof cream (e.g. cold cream) around your ears, neck, and hairline to prevent staining. Use at room temperature around 20 -30oC to get proper results. Make sure that the mozzle is firmly set onto the bottle with the side-locks engaged. Hold the Bottle parallel to the Special Comb Brush. Press the button of the Nozzle to dispense cream while moving the Bottle along the special comb brush. Keep the bottle away from face, sink and walls etc., when you first dispense for the cream may splatter. Do not dispense too much cream to avoid it from dripping when applying. To dispense a small amount of cream, disperse the cream along the grove line by pressing the button sufficiently until it stops. - Do not hold the Bottle perpendicular to the Special Comb Brush for the cream to be blended well on the hair. Start application from the grayest area. Apply a sufficient amount of cream from the roots and spread to hair ends by combing gently. Keep applying the cream while parting the hair strand by strand. Keep the cream away from the eyes. Avoid contact with the scalp. Use the end of the Brush side to apply the cream to the hairline and temples. With the Comb side, comb through well to distribute the cream evenly. Make sure that all hair is completely saturated with the cream. Finally gently work into all hair by hands. Avoid scratching the scalp. Do not rub the cream into your scalp. Apply a sufficient amount of cream only to new growths. Do not start from hair ends to get even results. With the Comb side, distribute the cream well from the roots to the ends. Leave it on for 5 minutes. Shampoo well, finishing with conditioner. Dry and style as usual. Avoid water coming into contact with eyes. Wash the Nozzle clean. If not washed, the cream may clog the nozzle. Press both side-locks fo the Nozzle and pull it off the Bottle. Insert the Washing Syringe into the back side of the Nozzle. To wash the two holes, blow them with the syringe in warm water. Wash the Special Comb Brush, the Washing Syringe and the Protective Gloves. Allowing them to dry before stroing. Make sure to avoid staining the sink and floor. Keep the Nozzle and the Bottle separated for storage. Store in the a place away from high temperatures. (Keep in a cool place). Dark discoloration of the first cream which is dispensed next time will not affect color results. Note: Read the Instructions provided on the label thoroughly before use.